An access point is the device that allows multiple wireless devices to connect with each other. Just like a HUB or switch connects multiple devices together in a single or multiple wired LAN networks, an access point connects multiple wireless devices together in a single wireless or multiple wireless networks. An access point can also be used to extend the wired network to the wireless devices. Based on the functionalities, we can categorize the access point in three types; standalone access point, multifunction access point and controlled access point. Let’s understand each type in detail. A standalone access point provides the same functionality in wireless network which a switch or hub provides in the wired network. It provides connectivity between the different wireless devices. It accepts frame from the connected device and, based on its physical address, forwards it to the destination device. Both the wired network and the wireless network use the different networking standards. Wired network uses the Ethernet standards while the wireless network uses the IEEE802.11 or Wi-Fi standards. A device which only understands and supports the one type of standards from the Ethernet standards and the Wi-Fi standards cannot process the frame that is formatted in the other type of standards. For example a regular Ethernet switch neither understands the frame formatted in Wi-Fi standards nor processes it. Access point supports both standards. Based on the destination device, it converts the received frame before forwarding it. For example if it receives a frame that is formatted with the Wi-Fi standards and have a destination address that uses Ethernet standards, it formats that frame with Ethernet standards before forwarding it to the destination. Access point uses radio signals for connectivity. Any device which falls in its signal range can connect with it. This feature makes it more flexible but less secure in comparison with the regular Ethernet switch. To enhance the security and stop the unauthorized access, the Access point uses authorization feature. Based on the security and the flexibility requirements, it can be configured to allow all users or to the selected users. A multifunction access point is the combination of two or more devices. In this combination an additional device or devices are merged with the access point to provide the additional functionalities along with existing functionality of the access point. A wireless router which ISP uses to provide to the Internet connection is the perfect example of the multifunction access point. It consist of three devices; an access point, a regular Ethernet switch and a router. 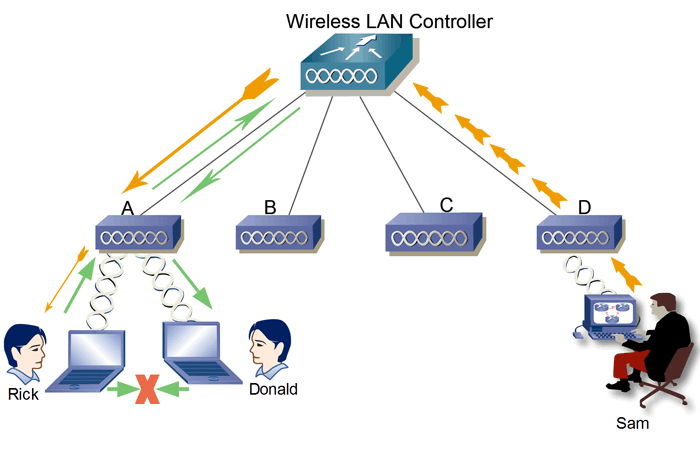 A controlled access point works as the client of the Wireless LAN Controller (WLC). Technically a controlled access point is known as the Lightweight Access Point (LWAP). LWAP doesn’t take any forwarding decision. Upon receiving a frame from the connected device, instead of forwarding it to the destination device, it forwards that frame to the WLC. The WLC, based on the security configuration, makes decision whether the received frame should be forwarded or discarded. If the frame needs to be forwarded, then it sends that frame to that LWAP, to which the destination device is connected. Then that LWAP sends this frame to the destination device. The WLC – LWAP setup is usually used in the company environment to span a single wireless network in large geographical area. This setup allows users to roam around the office premise, campus or building and stay connected to the network. In this setup, it doesn’t make any difference which LWAP a user uses to send and receive the frames as long as that LWAP is controlled by the same WLC. 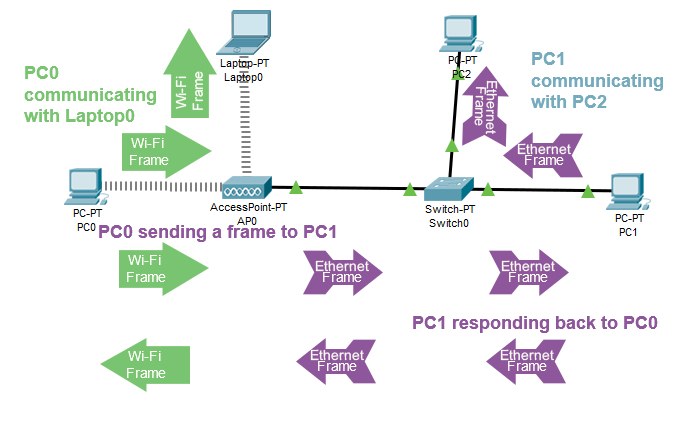 Since all forwarding decisions are taken by the WLC, an LWAP does not allow direct communication between the two devices, even if they both are connected with it. 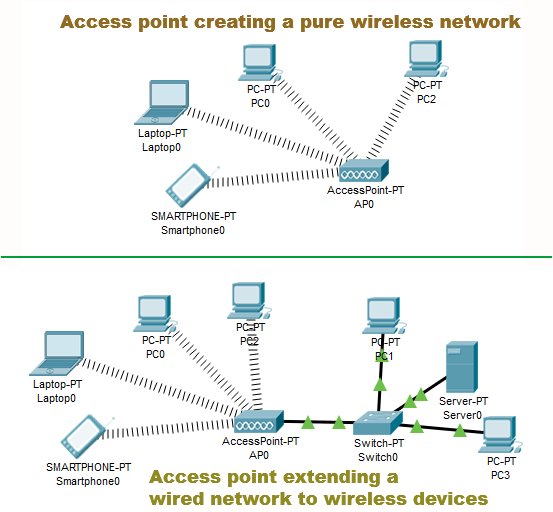 Access point connects multiple wireless devices together in a single wireless network. Access point supports both type of standards; Ethernet and Wi-Fi. Access point uses radio signals to provide the connectivity. Based on functionality an access point can be categorized in three types; standalone, multifunction and client. A standalone access point works in the wireless network exactly as the switch works in the wired network. To control the unauthorized access, Access point uses authorization. 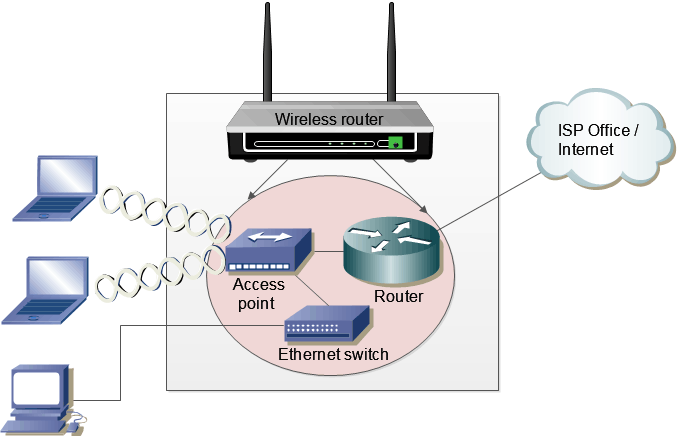 To extend the coverage area, multiple access points are used together under a Wireless LAN Controller. An access point which works under the WLC is known as the LWAP (Lightweight Access Point). In WLC-LWAPs setup, the WLC controls and manages all LWAPs. A LWAP works as the bridge between the WLC and the end device. That’s all for this tutorial. If you like this tutorial, please don’t forget the share it friends through your favorite social network.